We were looking for a light, easy-to-serve, sweet dessert to end the Passover Seder. 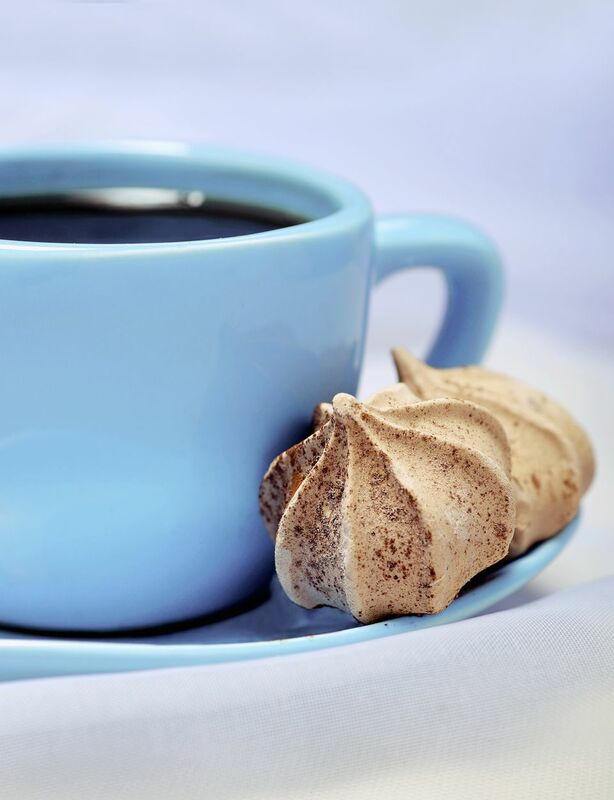 So, we tested these coffee meringues one Shabbos, and everyone -- even the kids -- loved them. Not only are they delicious, but they've got a surprisingly stunning appearance, as the coffee grains give the meringues a nice color and stripe. Best of all, they can be prepared a few days before the Seder and stored in an airtight container. Preheat the oven to 250 F. Line 2 cookie sheets with parchment paper. Set aside. Place the egg whites and salt in a large mixing bowl. Using electric beaters or an electric stand mixer fitted with a whisk attachment, beat the egg whites on high speed for 4 to 5 minutes. Add the sugar a tablespoon at a time while beating continuously on medium-high speed until the meringue is glossy and holds stiff peaks, about 10 to 12 minutes. With a spatula, fold in the coffee and vanilla until the coffee is mixed in just enough to create stripes. Fit a pastry bag with a large piping tip and roll down the top a few times. If you don't have a pastry bag, use a large Ziploc bag (you won't need a piping tip); fold the bag 2 to 3 times to make a cuff on the outside of the bag. Using a spatula, transfer the meringue from the mixing bowl into the pastry or Ziploc bag. Unroll the cuff and twist the top a few times, to close the bag and force the meringue into the bottom of the bag. If you are using a plastic bag, use scissors to snip a very small corner off of the bag. Squeeze 1 1/2 inch circles of meringue onto the cookie sheets. If it is coming out too slowly, snip the hole a little bigger. If you squeeze slowly and then pull the tip up you will get a pretty top. Place in the preheated oven and bake for 2 hours. Turn the oven off and leave the oven door partially open. Leave the meringues in the oven for at least another hour. Remove the meringues from the oven and carefully peel them from the paper. If they stick at all, return them to the oven for another 30 minutes to finish drying out. Cool completely on oven racks. Store in an airtight container. After an elaborate holiday meal like the Seder, a cookie platter and fresh fruit is all you need for dessert. These Coffee Meringues pair well with homemade Coconut Macaroons, Chocolate Hazelnut Stuffed Dates, and Flourless Chocolate Banana Cookies. Of course, there's no need to save the recipe for Passover -- try it any time of year for a sweet treat with afternoon coffee, or as part of a dessert spread. Meringues make a great DIY food gift, too. Prefer to save the yolks for later? You can freeze them. Why Make A Key Shaped Challah? An Apple and Dried Cherry Crisp That's Deliciously Dairy-Free! Yes, This IS your Grandmother's Coffee Cake!